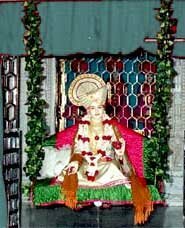 The idol of Lord Swaminarayan is seated on a swing during the month and pujas are performed. Hindola festival provides an opportunity for a devotee to immerse in Lord's murti. Hindolas are a mode to meditate on the Lord. Hindola festival finds origin in the life of Lord Krishna – it is believed that Gopis rocked Lord Krishna on a decorated swing in the forests of Vrindavan.